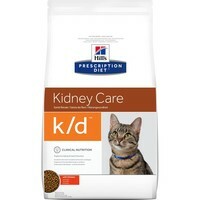 Hills Prescription Diet KD Kidney Care Dry Food for Adult Cats is a complete and balanced diet to strongly improve the quality and extend the life of cats with kidney disorders. With low levels of phosphorus and a restricted level of high quality protein, the food targets the kidney and hearty functions of your cat, and supports their renal function in cases of chronic or temporary renal insufficiency. My cat Millie likes the diet kidney care food and always chooses the dry food in preference to other foods. She has been eating diet food for a couple of years now and her health does not seem to have deteriorated. This food was recommended by our vet as our cat has Kidney problems. Since our cat has been on this food his condition has greatly improved. He seems so much healthier and happier. I'd definately recommend this product if your cat has renal problems. My 14 year old cat was diagnosed with kidney disease last year and as well as cutting out all the treats she loves eg Tuna, we tried really hard to gradually get her onto a renal diet as recommended by the vet. She's a cat that likes variety in her food so we've struggled to get her to eat any of the brands of renal wet food but she loves this Hills k/d dry food - eats it daily. By having this dry food and combining senior and renal wet food she has maintained a good appetite and kept her weight up - which is always a worry in older cats. I can recommend this dry food to anyone in a similar situation with a fussy cat! My 14 year old cat was diagnosed with kidney disease last year and the vet recommended that we put him on a renal diet. After trying various foods we found that he loves this one. Now he's gained weight and his urea count has come down. Very pleased with this and a great price on VetUK! We bought this product for my mum's oldest cat who was very old and had kidney disease. It reduced the amount of strain that normal cat food (even the senior variety) put on his kidneys and made the last year of his life much more comfortable than it would have been if we had carried on feeding him normal dry food. Very highly recommended for cats with kidney disorders.